Greenwald did, however, take out a little insurance when he added that even if he was wrong, and Omidyar’s commitment should unexpectedly dissipate at some future time, still there was no grave danger because Greenwald and his fellow writers would block any efforts to impose restraints, and, in the unlikely event they should fail at that, Greenwald would leave the operation. Perhaps most important, Greenwald noted that freedom from coercive restrictions would apply not just to a few of the best known writers, but to everyone writing for Intercept, and presumably for First Look as well. Okay, so far so good, but what about other dynamics that typically generate non-adversarial journalism? Owners rarely issue coercive commands. More often, reporters censor themselves, which they describe as freely doing whatever they please. That is, reporters spontaneously self impose limits partly due to their mainstream training and partly due to wanting to endear themselves, without being forced to do so, to owners who are their source of income and tenure. And perhaps the most effective censoring dynamic is the most subtle one. A writer who operates in a hierarchical, class-stratified institution, typically rationalizes his or her subordination as arising from the inevitability of such a structure. Soon the structure’s values become second nature to the writer. Derivatively, the writer never journalistically questions those values. This type journalistic conformism may have eluded Greenwald’s view of Intercept. Another concern put to Greenwald was that First Look and Intercept could appear exemplary when viewed in isolation, but could actually turn out problematic when viewed in the context of their broader impact. For example, suppose First Look and Intercept hire a team of progressive journalists, who thereafter no longer write for other outlets where they were previously employed. Also suppose Greenwald’s prognosis of no restraints pans out perfectly so the many writers Intercept hires enjoy a welcoming environment for their work. So far, so good; but would that mean these writers would generate more and better output than if they were, instead, still employed at various other venues such as theGuardian or Rolling Stone? And would it mean their work would get as wide visibility as if their articles had appeared in those other venues first? 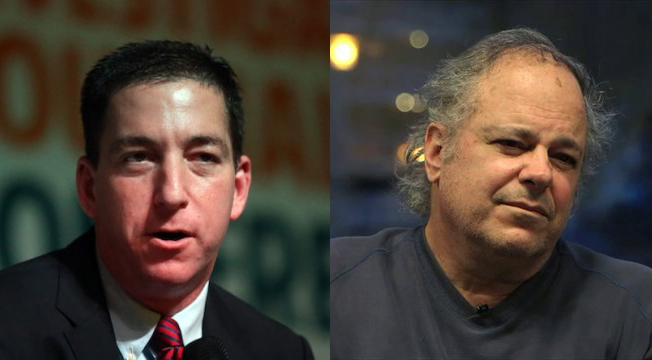 Which gets more visibility, a Greenwald article that appears on Intercept or a Greenwald article that appears in the Guardian? What about Taibbi writing in Rolling Stone or at First Look? Will the synergy of bringing many folks into one venue even with a supportive owner outweigh the losses of their leaving other venues? Greenwald presumably thinks the new project will enhance output, quality, and visibility, but is that certain? By putting lots of folks under one organizational roof so there is one main vehicle for the public to view their work, couldn’t the number of people seeing the writers’ work decline? Could the total amount of work they collectively generate decline? The verdict is still out on all that, but after many months, there is missing content at other outlets, and it’s absence isn’t matched by new content at First Look and Intercept, much less matched in outreach. If First Look and Intercept evolve so once they are fully operational they bring writers into proximity of one another and cause mutual aid among them, and so they also stimulate, aid, and defend writers so that writers’ productivity and its quality and visibility rise, then the benefits of many writers working for one venue will likely outweigh losses due to their leaving other venues. But will that happen? Another concern is a possible downside of hoped for success. What if the team of writers at First Look and Intercept does produce more quality output than in the past, and the visibility of the work goes up, as well? In short, what if the project succeeds in its own terms? In this scenario, Intercept provides lots and lots of material, all free, to a wide audience spanning most or even all progressive constituencies, and then reaching out more broadly as well. Intercept would still not provide everything the alternative media for all those constituencies now provides – by a long shot – but could its relative abundance of material damage progressive media’s ability to keep on providing all its additional material, albeit unintentionally? Could success for First Look/Intercept not only lead to progressive media losing some of its best and more productive contributors, due to their being hired away, but also lead to people seeing First Look/Intercept as a free source with abundant content, so why bother materially supporting or even visiting old familiar progressive media sources? If so, and if we take into account the possibility of the larger outfit in a year or two or five drifting away from being adversarial and toward conforming. Then we would have one media outfit instead of many, and the one would be less good than any of the many. We all understand that a massive commercial store can bankrupt many smaller operations with which it partially overlaps but which in sum deliver all kinds of additional and different material. Witness the demise of local bookstores. But somehow we don’t get that a big new media operation might have the same effect on many smaller media operations, including not replacing their contributions and thereby fostering a considerable loss. Of course none of this is inevitable, but its likelihood climbs dramatically if no one does anything explicit to avert the outcome. Greenwald has indicated, at least as I hear him, that he shares these concerns, and that First Look and Intercept will certainly address these issues. I suggested three preliminary ways it might do so, and urged the need to conceive and assess various other possibilities. Intercept could have an opinion section that pays good fees to progressive writers to augment their incomes and thereby take some pressure off alternative media, as well as allowing the writers’ essays to continue appearing on their more accustomed sites while ensuring and even requiring that the writers keep their alternative media ties and connections. Intercept could have a best of the web section and – perhaps uniquely – could generously pay a range of alternative media sites for the right to freely republish their material in that section. Of course, they wouldn’t have to pay, given how the internet works – but given their financial means, they could choose to do so. Both these efforts would get Intercept a lot of good daily content to ensure return visits on a regular basis. But both would also funnel funds into alternative media and its writers, while aiding alternative media’s persistence and directing new people to its various venues. Intercept could simply give direct grants to diverse alternative media with obvious positive possibilities. Greenwald replied that we would talk through these various options once some other initial tasks for Intercept establishing itself were complete, but after that promising beginning, and despite repeated inquiries and reminders, as ensuing months passed, such talks did not happen. Then John Cook was hired to be “Editor in Chief” of Intercept. He was, prior to that, largely responsible for a site called Gawker. So I looked at Gawker, and to me it seemed like a kind of left gossip site. I feared that Omidyar’s hiring Cook meant that Omidyar was thinking about revenues and how to bulk up audience by any means rather than only by socially-responsible means. That is, rather than having 60 or 100 opinion pieces a month each paid well and overall leaving the writers connected to other alternative media, or rather than having a best of the web section and paying regular fees to help finance the venues originating that content – Intercept would run gossipy and otherwise socially-questionable but audience-gaining content. Did Omidyar like Cook’s track record in that respect? I found Gawker as a model rather alarming. But I certainly had little to go on. Maybe Cook’s inclinations will turn out to be much better than what my brief look at Gawker made me fear. Indeed, perhaps Cook was never comfortable with the Gawker approach. However, there was another troubling facet of this hire. What, after all, is an “Editor in Chief”? What could be the role of an editor, much less of an editor on top of other editors, in a periodical that is pledged to reject editorial oversight of its writers and their content? I still wonder about that. For example, does an Editor in Chief determine what articles run? Does an Editor in Chief assess article content, case by case, while also being able to hire and fire writers? Or are the Editor in Chief’s tasks more in line with adversarial journalism…such as merely seeking to avoid redundancy, or to avoid plagiarism, while also urging (but not forcing) attention to what he sees as important issues? But if the Editor in Chief tasks are only desirable ones, couldn’t they be handled by a workers council of writers instead of an elevated individual? Ultimately, is the designation “Editor in Chief” a sign of adopting a classist internal hierarchy barely distinguishable from mainstream media structure and its related logic, or is it merely a benign but poor choice of a misleading label? Recent communications to Greenwald seeking to talk about ideas for building Intercept/Alternative Media relations that could benefit both, led to replies that I should query Cook on the topic. Queries to Cook on the topic went unanswered for a while until he finally indicated there was nothing much to talk about. Yet, by Greenwald’s account, offered only weeks before, these issues are very important to pursue. So did Greenwald abdicate concern about relations with alternative media to Cook? And even as we might understand Greenwald wanting to focus only on his journalism, wouldn’t distancing writing from other policy, and vice versa, be precisely the kind of worrisome organizational division of labor that might warrant concern about the project’s direction? I hope that a large institution that could and should directly aid alternative media will do so as Greenwald, Cook, and Omidyar, decide to explore ideas for good relations with alternative media and to implement those that seem best. I also hope First Look/Intercept will soon accelerate its development to take advantage of its incredible visibility and not squander initial interest and good will. But I also worry that the project may turn out minimally adversarial with respect to corporate power and classist hierarchy, even if it continues to address libertarian privacy concerns against government intrusion. Indeed, I suspect there may be a connection between establishing mutually beneficial ties to the rest of alternative media, or not, and remaining unstintingly adversarial, or not.